Having spent many a quarter on the arcade classic BurgerTime back in the 1980’s, and later playing the console version, I can honestly say that it is one of my all-time favorite video games. 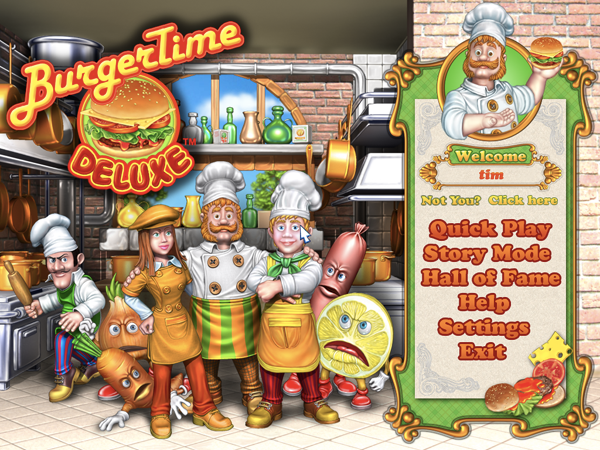 So imagine my surprise when I saw the announcement online that BurgerTime Deluxe had been released for the Macintosh! 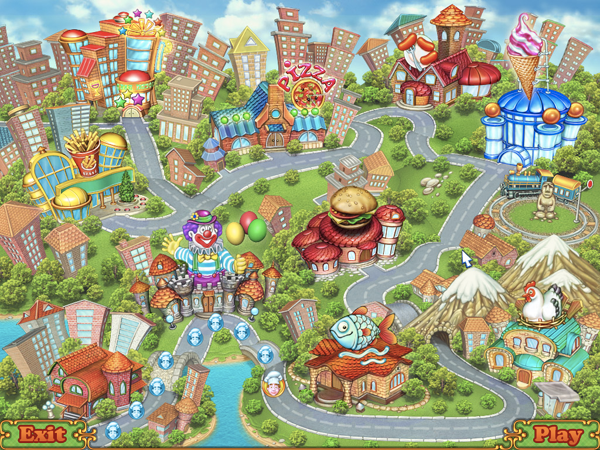 The basic concept and play mechanics of the original game are still here: run around the game board, running over the various parts of the hamburger to drop them down to the next level, eventually making the complete burger on the plate. Make all the burgers, move on to the next level. Trying to prevent you from doing so is a variety of bad guys, from Pickles, Carrots, Onions, Eggs, and other food-stuff. All they have to do is touch you to kill you. For defense, you are armed with pepper which you can throw at the baddies to temporarily paralyze them and make it safe to pass by unharmed. The original arcade version had, I believe, six or seven different levels. The new version has over sixty. This makes replay value very high, but unfortunately, you cannot simply skip to any level you want to play. There is both a Story Mode and a Quick Play option. In Story Mode, there is a weak story-line that, honestly, I simply skipped past. It takes you from one level to the next, and the only real difference between Story and Quick is a basic tutorial at the beginning of the Story Mode, and a slower ratcheting up of bad guys. 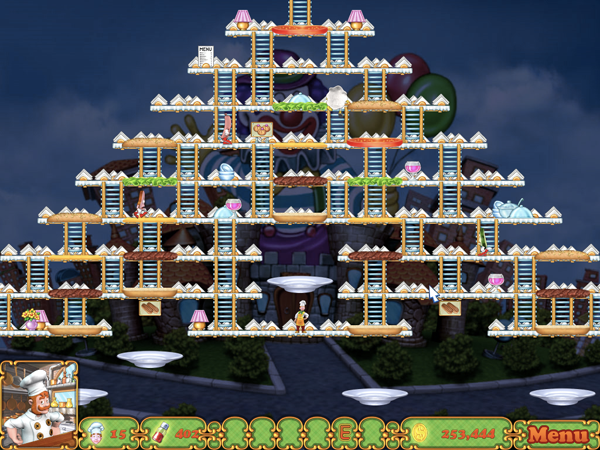 Quick Play assumes you already know how to play, and the difficulty kicks in right on the second level. For $20, BurgerTime Deluxe is not for everyone. (And it would make a much better and popular iPhone App.) As David Cohen asked via Twitter “Is BurgerTime worth $20? It’s a 27-year-old game – don’t remember it being that great…” And he’s correct. This is not worth $20 for most people, but for someone like me who still holds the original BurgerTime as one of my all-time favorite games, it’s a cheap price for hours of nostalgia. Pros: Fun and easy play, loads of levels, and great replay value. Cons: Mouse control is horrible, and keyboard control causes cramps. No joystick option. No direct level selection. No classic mode to let you play the original version. Tested under both Mac OS 10.5 and 10.6 (Snow Leopard) with no problems.